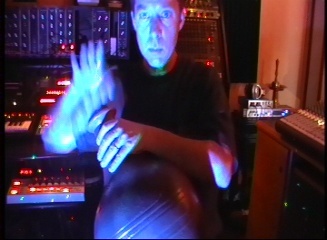 Composes and produces Ambient Electronic, Shamanic, Space Music. Multi instrumentalist and composer Dan Pound was classically trained at an early age on piano, guitar and stand up double bass by way of private lessons and in an academic setting. As well, the desire to compose and write songs took a strong hold of Dan early on. Through much of his adolescent years he played in bands, and struggled to get noticed as a singer/songwriter, submitting numerous songs to producers and music directors, but mostly with no real signs of tangible successes. Meanwhile, much of Dan's influence and inspiration came from listening to a variety of music, mainly classical and instrumental soundscapes. Upon discovering artists like Tangerine Dream, Steve Roach, Vangelis and the like, he felt compelled to start experimenting and composing in this style of non-linear and un-formulaic writing. The early phases of this period proved to be very creative and prolific for Dan, churning out numerous homemade CDs at a rapid-fire rate. After acquiring a degree in audio engineering, more gear, and a little bit of noticeable success, as well as spending a 3 day mentorship under ambient master Steve Roach, Dan decided in 2007 to develop and start his own self-publishing and record label that he dubbed 'Pound Sounds'. He now produces music out of his own studio under this label. The success and growth of Dan and his Pound Sounds label has been slow and progressive, earning Dan credit on a variety of multi media projects in the form of documentaries, short films, video games, TV shows and commercials, exhibit presentations, guided meditations and more. As well, Dan has earned a noticeable position on the radio charts in the ambient music genre, and sells his albums through his own website, I-Tunes, Amazon, Rhapsody, CDbaby and other on-line distributors. Greenpeace Organization: music used for the documentary, "Changes in Climate, Changes in Lives"
Random Productions: music used for the film, "Living Proof"
Monkey House Productions: core music used for the documentary, "Southern Fried Bigfoot"
Foundation for Global Humanity: music used for the documentary, "Seeding Change"
Music used for the documentary, "Women In The Military: Willing, Able, Essential"
Nature channel (PBS): music used for the documentary, "Kilauea: Mountain of Fire"
Peregrine Group Films: music used for the short film, "Valley Of The Moon"
IronCode Software: music used for PC video game, "Pahelika: Secret Legends"
City Interactive: music used for PC video games, "Art of Murder: Cards of Destiny" & "Chronicles of Mystery: The Tree of Life"
NSO/AURA Inc.: music used for an educational video about (ATST) Advanced Technology Solar Telescope. Poclain Hydraulics: music used for an educational video showing this company's current technology. Epic Meditations: music used for "Ultimate Relaxation & Daily Renewal" guided meditations. Dan plays analog and digital hard and soft synths, guitars, shamanic percussion and voice, Native American flutes, Didgeridoo, ocarina, harmonica, Tibetan singing bowls, drum sampling and programming, field recordings. Tangerine Dream, Steve Roach, Vangelis, Brian Eno, Patrick O'Hearn, Vidna Obmana, Micheal Stearns.